Friends, it’s been too long since we’ve done an update to the blog. It turns out that winning events and prepping the Corollas for 3 events in 3 months is kind of time consuming. – Sorry, we’ll fix that this fall. ’86 Day, or August 6th is when Corolla people like to celebrate the Toyota with the heart of gold, the AE86 Corolla Sport! 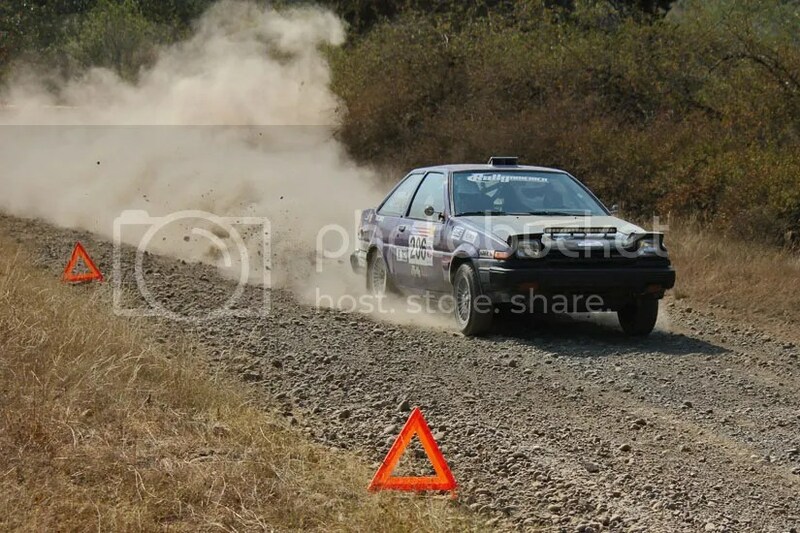 This year, we’ve decided to put together a gallery of shots from the past year’s rallies featuring the Panda-Crane Racing Corollas, #Patches, and the #PurplePanda. 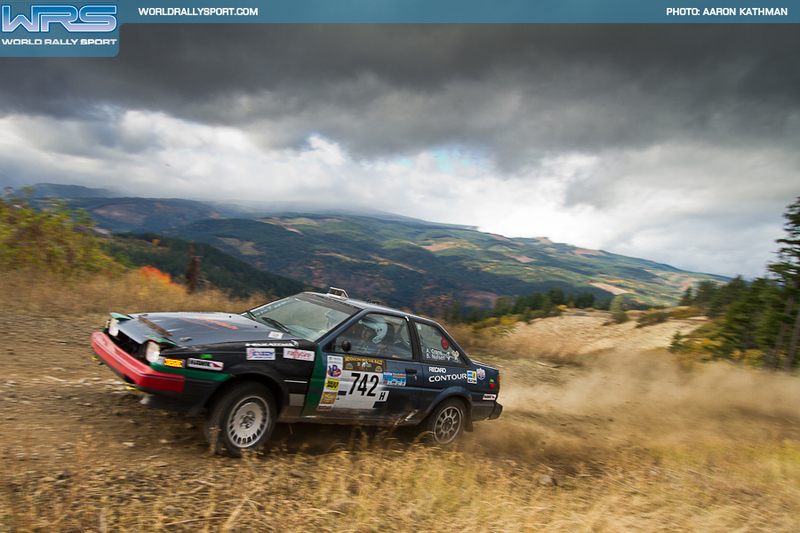 Highlights include WRC Mexico, Oregon Trail Rally, and Nameless Rally (the Idaho Rally was a low light, and won’t be mentioned). -Enjoy the pics and check out the quick essay about why we race these things below. Why the Corolla? We get asked this all the time and below are a selection of bullet points and stock answers we give to people. Fun. The drifters know, stringing together turns is a blast. Reliable. This is known. It is a Toyota after all. Pedigree. The fact that there is a ‘Hot Version’, the GT-S with a Limited Slip Differential on the option sheet should be a clue. Easy to Drive. Ask me to blaze away in your Saab or Subaru? I will understeer it into a curb. The Corolla gives me the ‘touch’, narrow and balanced, with great feedback. Ask me why my stock mirrors are gone (I clipped them on chicanes or trees, the fenders were untouched). Enthusiast love. People complain about the ‘Drift Tax’, where prices on parts went way up when drifters started catching and crashing their AE86 Toyotas. We love it. The cars are rescued from junkyards, and any parts are always available. Maintenance. Tiny FWD engine bays, with weird mounts and axles going every which way are cramped and awful. Longitudinal is the way to roll. They look rad. Seriously, you’ve seen the pictures . . . Suspension. We’ve got it. FWD cars (Honda . . ) don’t. Balance. Throw a cage in a Corolla, 50/50 guaranteed. The 1.6l 4age engine. Wikipedia will tell you why. Economy. Everything is relative, but relative to some of the starter cars that show up, the Corolla is faster, fun-er, and cheaper. SpeedHunters.com. Go check their coverage of ’86 day. So, That’s all we’ve got. Come to MegaBurger in SODO Seattle on Tuesday August 6th around 7pm. 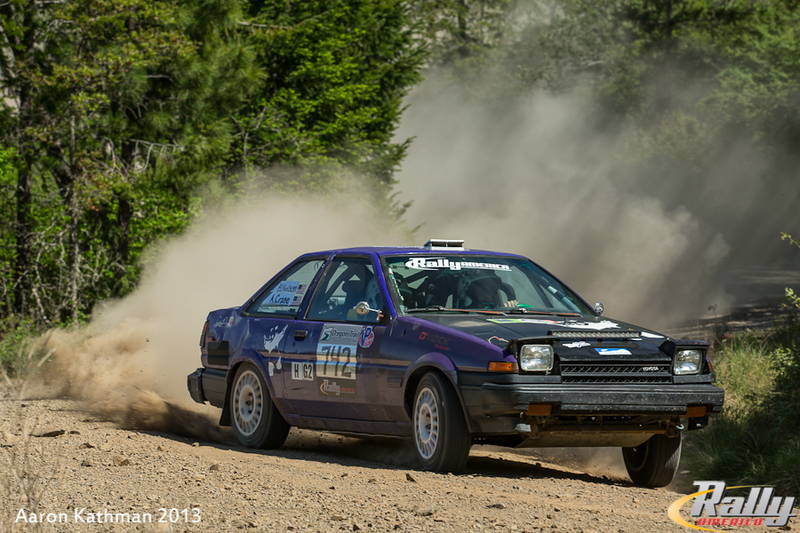 We’ll be there showing off some well run Corolla Rally Cars. The hot tip is that we’re also building better, faster Corollas (#Hatches) as we speak. It has been far too long since our last post. Everyone has been busy preparing for Mexico. Adam decided to wisely call off racing as his build was too far from ready, and the time and money investment was too much for an incomplete car. I, possibly unwisely decided to forge onward. Adam got Van Vanlandingvan ready to go for the trip, while I prepared the Purple Panda. Jeff and I left Seattle Friday Morning March 1st and headed on our way. We had a wonderful lunch in Pendelton Oregon and made it to Provo Utah the first night. We got up at 530am and kept hauling the next morning until we reached Los Cruces New Mexico. We had a good time and met some nice Bartenders at the M5 club that night. Once again getting up at 530 we bolted through the endless desert that is Western Texas and arrived in Laredo in the evening. Sadly, as I write this we are still in Laredo. We got up this morning and headed for the border, didn’t have issues crossing, but because they think of the box van as a commercial vehicle we were denied a temporary permit. We spent 12 hours at customs waiting for brokers to try and figure out how to get us through. Around 630 we decided to call it quits and headed back across the border to get dinner and a bed to sleep in. We think we’re going to be able to get across tomorrow, but if that fails we’re emptying as much into the rally car as possible and driving the last 600+ miles to Leon. Here’s hoping for us not being forced to that. I am writing you this e-mail because Myself and Adam Crane are attempting to rally in the far off exotic country of Mexico. First a little back story. 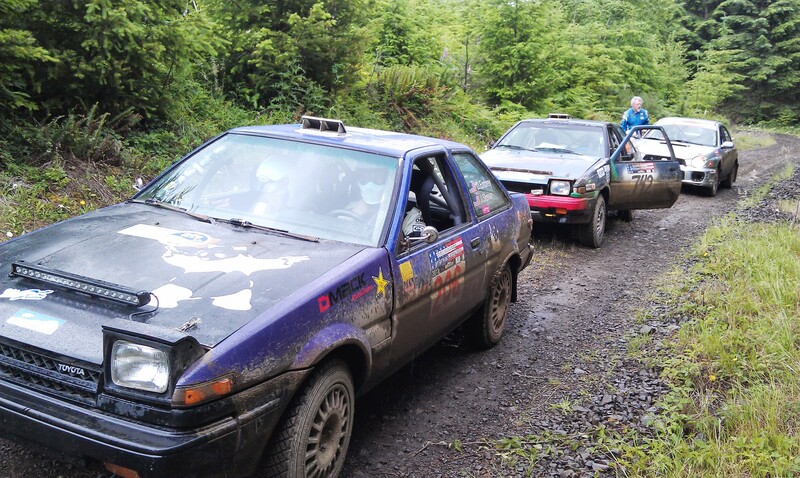 For those of you that do not know, Adam Crane has been rallying his 1985 Toyota Corolla for over 6 years now, and for the past two I have joined him with my own 1987 Corolla. 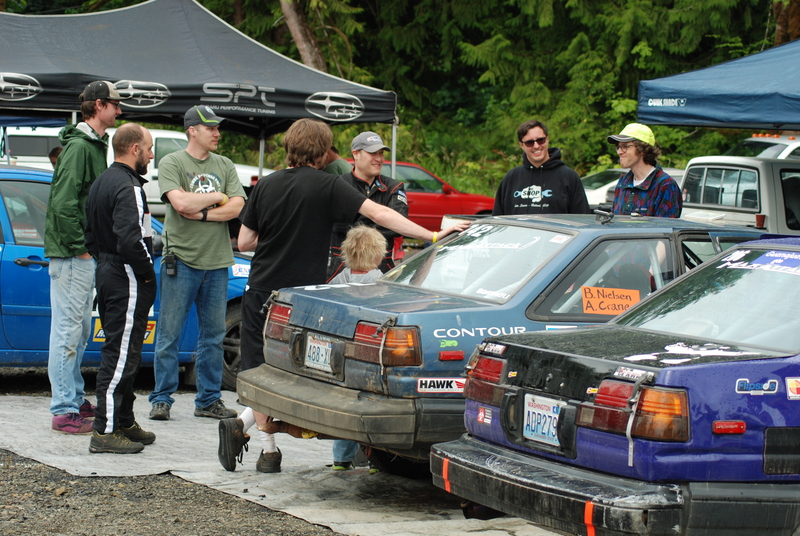 We have had a lot of fun with local rallies from Canada, to California, and everywhere in between. Every year a rally takes place in central Mexico of the highest magnitude. 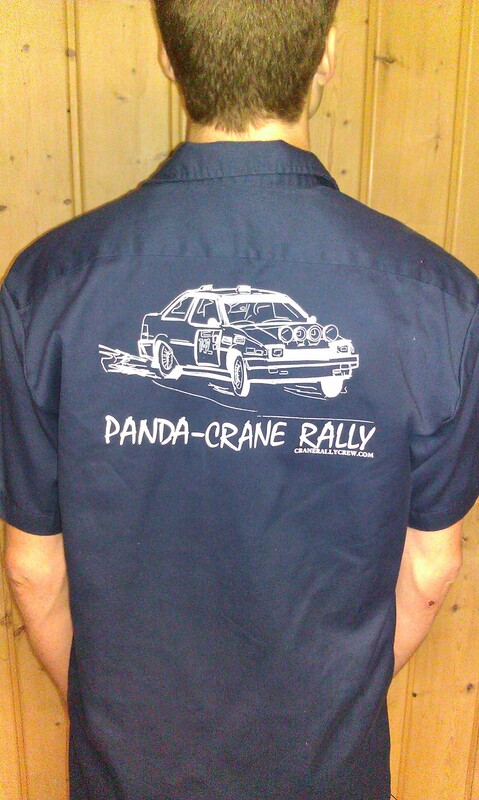 Adam and I have set the sights of team Panda-Crane to attend Rally Mexico in March of 2013. Adam has been buried in his garage for the past few months building an all new Corolla for the event, and myself and Ken have been busy getting the Panda up to the standards necessary to compete in Mexico. OK, enough of the boring stuff. The reason for this e-mail is that we are selling T-shirts, Hoodies, and Dickie work shirts with the team logo on it to try and raise a little bit of money to help us along the way. Everything is Navy Blue, the T-shirts are $20, the Work Shirts are $30, and the Hoodies are $35. They will all have the attached logo on the back. If anyone is interested please respond directly back to me with the shirt(s) you are interested in, and the size that you want. All of the shirts will be high quality screen printed and either mailed to you, or hand delivered by myself. I will be sending the shirts out for print on November 9th, so I would like to get any orders by then, and will get them back approximately 2 weeks after that. If you know of anyone else who may be interested that I did not include on this e-mail, please forward it on. If we’re lucky enough we may raise enough money to buy a tire or two. Thanks everyone for taking the time to read this post. There is an event in Oregon called the Mt. Hood Rally. Since Doo Wops has faded due to Ray’s passing, Mt Hood gained the title of the North West’s best ‘local’ rally. It has good roads that are consistent from year to year. The roads are a nice mix of tight and twisty, ‘thread the needle’ fast stuff, and some rough sections that can test cars too. Entry fees and it’s place on the schedule make it a kind place to debut a car, or driver. This year there’s a bit of ‘old’ being mixed in. When I built ‘Patches’ I was issued a book, stating that the safety equipment met the rules. The book is also a log of the events the car has run. Only the log book in ‘Patches’ knows how many times we’ve run the Mt.Hood. I haven’t had to staple more pages in, but I’m really close to 30 events, and for the first time, the driver’s signature on the page, won’t be mine. I’m doing the event. I’m co-driving for Larry Clark, Dave’s dad. I’ll even be in a Toyota. Car #509. ‘Patches’ will be driven by Charles Buren of SafeDrives.com. I wish him luck. The ‘Purple Panda’ is hungry. Come on down to beautiful Mt. Hood Oregon next weekend, October 20th, for the Rally. 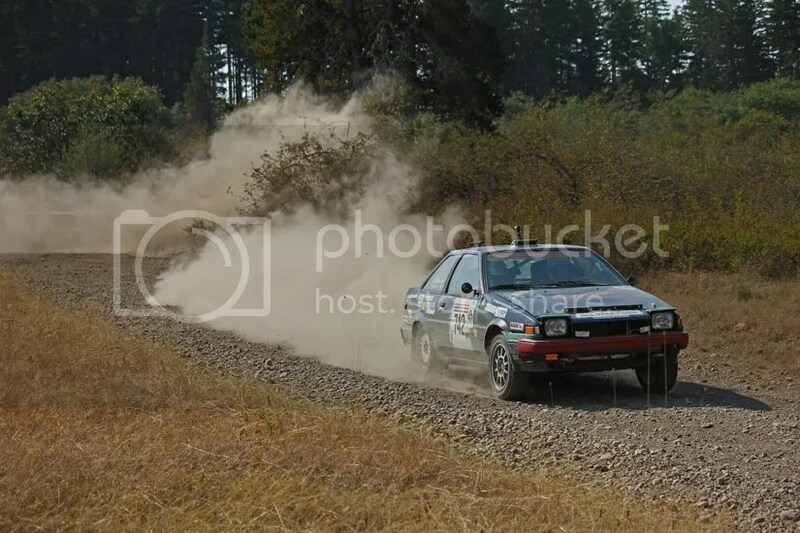 Thanks to the Organizers and Volunteers of the 2012 Olympus Rally, who, despite the fire danger and lack of spectators, gave us some long, fun, days of rally. 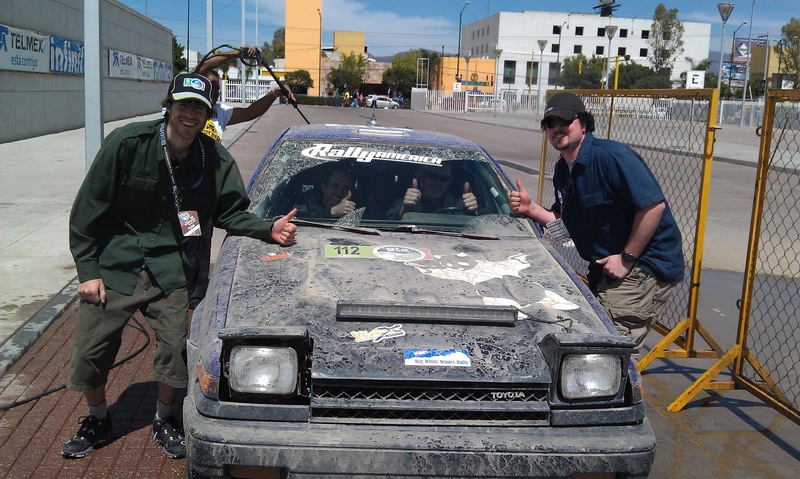 In case you were wondering, both Dustin in the Purple Panda, and ‘Patches’ with Britta and I, finished both days of the Rally. How did we do? There is a nifty results tabulator that can show you the 2wd stage results, which we think is better than sliced bread. – Three things to note, 1. Both Dustin and I ran out of gas on Stage 5. 2. Add 30 seconds to my time on Stage 3 (timing error in our favor- doesn’t affect our class results, does make us look like rockstars) 3. Stages 8 and 9 were canceled due to dust. Did we have anything else to report? Sure. Volvo wheels are weak. Dustin bent at least 2 wheels, destroying both tires. I bent a wheel too. We’re hoping to find some budget to buy some wheels from these guys: BraidUSA.com. – I also owe Al Kun a fancy rally wheel for letting me borrow a spare wheel. The next event is less than a month away! Mt Hood Rally will be down in Oregon on Oct 20th. ‘Patches’ is for rent, but Dustin is going to try and dominate like I did last year. I just wanted to share a great experience I had. I was looking for lights for the upcoming night stages of the Olympus rally. I went to http://www.visionxwholesale.com/ and talked to Rick Freeman, their Accounts Manager. Far too often good customer service and knowledgeable representatives are hard to find, but I can say that this was a truly pleasant buying experience. If you guys ever have any lighting needs don’t hesitate to talk to Rick.